Happy April IPPS Southern Region members! Planning for the annual meeting in Baton Rogue Oct 12-16, 2019 is coming along well. With 25 horticulture experts presenting on a wide variety of plant production topics we encourage you to register for the full meeting. To maximize your IPPS-SR annual meeting experience, we have made some schedule changes. This year, all of the award winners will be honored during the banquet held on Monday 14 October 2019 from 6-9pm. This includes the Fellows, Sydney B. Meadows and Student Competition awards. We will also recognize our generous sponsors during this time. The live auction will follow, which supports the IPPS-SR Educational Endowment Fund. We have also expanded the Question Box session this year! The Question Box Keynote program will be held at 7:30pm on Tuesday 15 October 2019 followed by our traditional question box session. 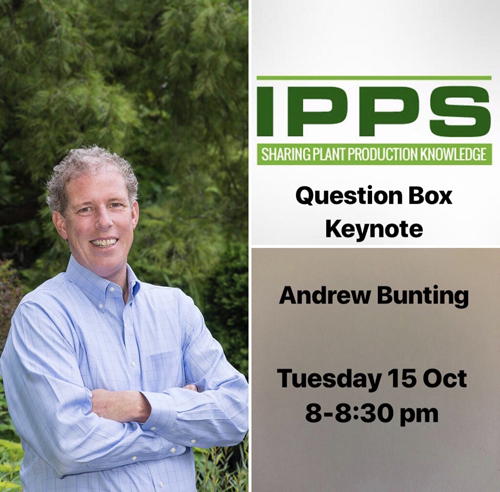 Plan to attend “A World of Possibilities: Searching for the Next Great Garden Plant” presented by Andrew Bunting, Vice President of Horticulture and Collections at Atlanta Botanical Garden. He will discuss his expedition work through the US, China, Taiwan and Vietnam in search of the next great ornamental plant. The Question Box will be held on Tuesday 15 October in the educational session room from 7:30-10pm. Please plan to attend the full meeting October 12 -16, 2019 in Baton Rogue, LA. We look forward to seeing you then!